MONTREAL - Claude Ruel, a reluctant coach who guided the Montreal Canadiens to a Stanley Cup in 1969, has died. He was 76. The Canadiens confirmed Ruel's death on the team's website. Ruel coached the Canadiens from 1968 to 1970 and again from 1979 to 1981, but was said to dislike the stress of coaching and worked mostly as director of player development. 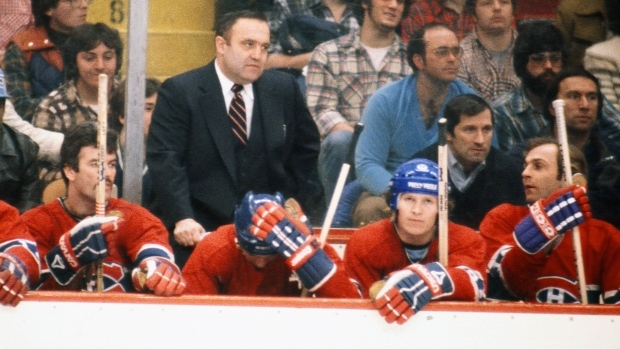 He succeeded Toe Blake as coach in 1968 and led the Canadiens to a Stanley Cup in his first season behind the bench before being replaced by Al McNeil midway through the 1970-71 campaign. He was called in again to replace Bernard (Boom Boom) Geoffrion early in the 1979 season and stepped down in 1981 in favour of Bob Berry. Many former Canadiens players, including Norris Trophy winning defencemen Larry Robinson and Rod Langway, credit Ruel with helping them develop their skills to become NHL players. "Claude would come two weeks before camp and work us out on the ice," Robinson said in a recent interview. "A lot of it was movement, getting the puck, passing the puck, receiving the puck, shooting the puck. "He had a way of creating mobility. Most of the guys on our defence could skate and could move around with the puck." Ruel coached 305 NHL games and had a record of 172-82-51. The Sherbrooke, Que., native was promising defenceman as a youth until he lost the sight in one eye after being struck by a puck. He joined the Montreal organization as a coach with the Junior Canadiens in the 1960s and later was promoted into scouting and player development jobs. The Canadiens have also recently mourned the death of legendary captain Jean Beliveau on Dec. 2 and forward Gilles Tremblay in November.